TAG Heuer's Grand Carrera is their most popular collection. These high-end, COSC-certified watches can measure 1/10ths of a second. Unique rotating discs serve as subdials and characterize the look of this series. 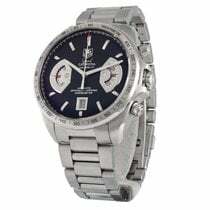 The Swiss watch manufacturer TAG Heuer is renowned worldwide for their sport watches and chronographs. The Carrera has been in production since 1963. The legendary chronograph was named for the Mexican Carrera Panamericana race, which is one of the most dangerous races in the world. Over the years, these wristwatch chronographs developed into icons of watch history. Earlier models from the 1960s are beloved among collectors and regularly sell for five figures at auctions. The watches in TAG Heuer's Grand Carrera collection follow in the footsteps of the first Carrera watches. Introduced in 2007, the Grand Carrera collection features high-quality timepieces certified by the Official Swiss Chronometer Testing Institute (COSC). During the certification process, watches are tested over a period of 15 days in four different positions and under three different temperatures. In order to be certified, they can only deviate up to -4 or +6 seconds per day. The watches in the Grand Carrera collection have different functions, depending on which movement powers them. The most well-known pieces in the collection are the chronographs, which are powered by either the Calibre 17 RS or the Calibre 36 RS. The 36 RS is particularly interesting; it has a frequency of 36,000 A/h (5 Hz). Since it vibrates at such a high frequency, it can measure time to 1/10th of a second. The abbreviation "RS" stands for rotation system. This refers to the rotating discs on the bottom half of the dial, which function as decentralized seconds as well as hour and minute counters. This design and use of discs is unique and defines the look of the Grand Carrera. With a diameter of 43 mm, these timepieces are rather large. The Calibre 8 RS powers models which feature a GMT function. GMT stands for Greenwich Mean Time and is a standard term for watches that display a second time zone. Grand Carreras powered by the Calibre 8 RS display the second time zone at six o'clock. A rotating disc with a 24-hour scale tells you what time it is somewhere else in the world. For example, you can use it to display the time at home while you're on vacation. The three usual hands for hours, minutes, and seconds tell the local time, and a large window at 12 o'clock displays the date. These watches have a diameter of 42.5 mm. At 40 mm in diameter, the Calibre 6 RS models are a bit smaller. They have decentralized seconds at six o'clock and a date display at three o'clock. A rotating disk displays the seconds; this is unique, seeing as most watches use a subdial to display their decentralized seconds. Are you looking for a chronometer-level chronograph with an unusual design? Then don't miss TAG Heuer's Grand Carrera collection. The watches in this series draw attention with their unique look: Rotating discs on the lower half of the dial replace more commonly used subdials for decentralized seconds as well as hour and minute counters. 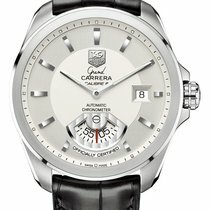 Some models use the Calibre 36 RS, which features a balance wheel that vibrates at 36,000 A/h (5 Hz). These watches can measure 1/10ths of seconds. For those who travel often, a watch with a GMT function is most practical. You can use it to keep track of the time back home and also the local time. Prices for Grand Carrera models start around 1,700 euros. New models with small seconds cost around 2,600 euros and chronograph versions cost around 4,000 euros. Pre-owned chronograph models sell for around 2,600 euros. Pre-owned GMT watches cost around 2,500 euros, while new models start around 3,000 euros. Blancpain's L-Evolution collection offers an alternative to the TAG Heuer Grand Carrera. The use of materials such as carbon fiber emphasizes the watches' connection to race car driving. A watch from the L-Evolution collection costs around 10,000 euros. If you're looking for a classic among more high-frequency watches, then take a look at the Zenith El Primero. A pre-owned version of this chronograph costs around 1,600 euros. The Grand Carrera watches have strictly sporty designs. The look of the rotating discs is unconventional, giving the watches special charm. Red or yellow accents on the bezel, dial, and crown emphasize this sporty look. TAG Heuer coats the stopwatch second hand in red or yellow, matching whichever color accent is used in the model. In some models only the tip of the hand is painted red. Watches with a leather strap and silver dial have a more distinguished look. Bicolor versions with 18-karat red gold increase the value of some watches. The titanium versions are especially sporty and feature a titanium carbide coating on the case. Titanium is well known for its durability and light weight. Red accents on the bezel, band, and dial create a contrast with the otherwise black watch. You have the choice between a stainless steel bracelet, a rubber strap, or an alligator leather strap. The alligator leather is available in either black or brown. TAG Heuer's special "soft touch" bands are also made of alligator leather and feel incredibly soft on your skin. Yellow or red stitching add even more color accents and a sporty look. Rubber straps with holes in them allow air to circulate between your skin and the strap, minimizing sweat. You can also adjust the length. Three-piece link stainless steel bracelets with satinized and polished parts are also available. A fold-over safety clasp with two push-pieces keeps the watch securely on your wrist. The Calibre 36 RS Caliper is one of the high-end models in the Grand Carrera collection. 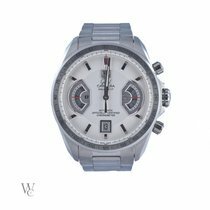 Its name already gives away that it's powered by a very special, fast-ticking caliber: the El Primero from Zenith, which vibrates at 36,000 A/h. This is one of the most famous high-frequency calibers there is. The Swiss manufacturer Zenith began developing a high-frequency movement in 1962. Seven years later, in 1969, they were finished, and presented a caliber that could measure 1/10ths of a second. Standard movements vibrate at a frequency of 28,800 A/h (4 Hz). At that speed, movements can measure 1/8ths of a second. "Caliper" was added to the watch's name, referencing the device used to measure the distance between two sides of an object, as well as the vernier scale on the dial. TAG Heuer uses and modifies this movement to meet their own requirements. Instead of three small hands, TAG Heuer uses rotating discs for the small seconds and the hour and minute counters. The discs move behind their stationary hands. TAG Heuer also made their own skeletonized winding rotor with Geneva stripes. The movement has a 50-hour power reserve. There's also a quick-set date corrector, meaning you can quickly and easily correct the date. TAG Heuer uses an innovative mechanism to display the 1/10ths of a second, which they've named their Rotating System disc. Similar to on a caliper, the inner side of the dial features a vernier scale to keep track of these split seconds. The French mathematician Pierre Vernier (1580-1637) had already introduced this scale in the early 1630s. Calipers still function today using the same principal: To count fractions of measurements, such as tenths of a millimeter, check which line on the vernier scale aligns exactly with the line corresponding to each millimeter. The Calibre 36 Caliper functions similarly. First, you push the start/stop pusher at two o'clock to stop the stopwatch function. Then, using the second crown at ten o'clock, synchronize the zero marker on the vernier scale with the stopped stopwatch second hand. The scale and the hand then correspond with one another, and you can look for the point where the lines match up. For example, if you stopped timing after about 25 seconds, turn the vernier scale until its zero marker is lined up with the stopped stopwatch second hand. Then look for the first line on the vernier scale that matches up with a seconds index on the dial. In this example, it's the second line on the scale. Therefore, the timed period is exactly 25.2 seconds. The design of the Calibre 36 RS Caliper is sporty, similar to most Grand Carreras. Certain elements of the watch even give it an avant-garde touch, such as the rotating discs and vernier scale. Two Geneva striped steel bridges with polished, angled edges quickly catch the eye. Domed and two-sided anti-reflective glass gives you a clear look at the dial and hands. TAG Heuer uses sapphire glass on the case back as well to allow a view of the movement. The case back is screwed on six times and a steel bar separates the glass into two halves.